Wow! What a first challenge! We are impressed with the way our designers took on this challenge. The theme for this week's challenge was using recycled materials to create a look. We let the door wide open on this challenge to see what our designers could really do! 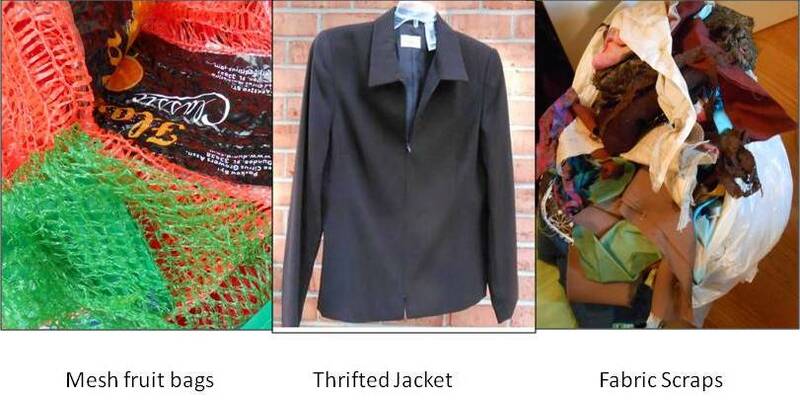 We told them they could use materials that would otherwise be thrown away, such as scraps from their sewing room. 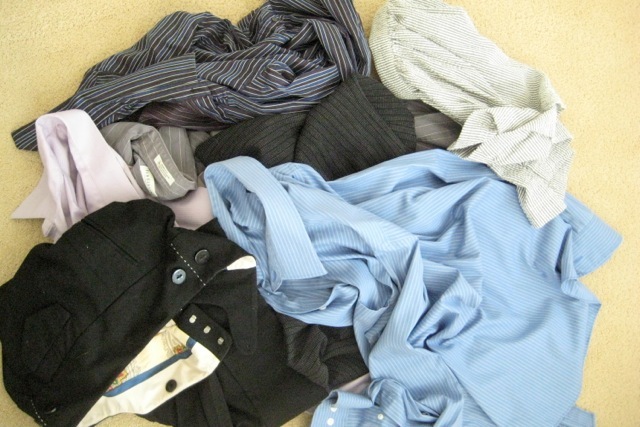 Or reinvent old pieces of clothing to create a new fashion forward look. Take a look at what they created! Make sure you vote for your favorite below! I cut up, dyed and reconstructed my wedding dress into a new garment. I was married over 6 years ago and this champagne colored dress has been locked away in my closet since. 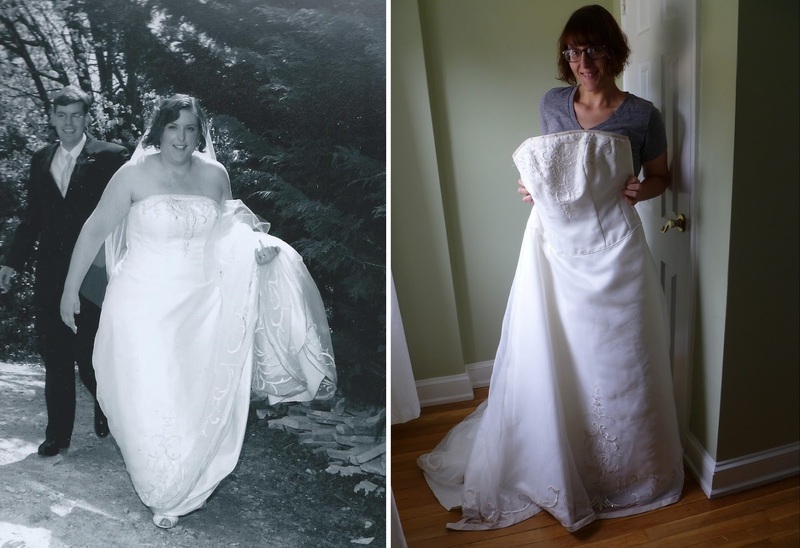 You can see me in my dress on my wedding day back in 2007... and then moments before I took a pair of scissors to them last week! After a few days of hand sewing, ironing, machine sewing and more ironing yet, I ended up with a hand dyed, flamingo pink, fully lined 1950s classic inspired satin party dress with some couture elements added in. I mashed up a couple commercial patterns along with adding some self-drafted elements to get what I wanted. I was able to cut the entire main fabric on grain from my satin!! I used the organza overlay from my wedding dress to hand sew an underlining into the bodice to give it more structure. I added a really bright, fun robin's egg blue pongee to line it. This is the only element of my garment that wasn't recycled from my wedding dress or a vintage notion. I included a vintage lace hem tape I happened to have, which was an exact match! 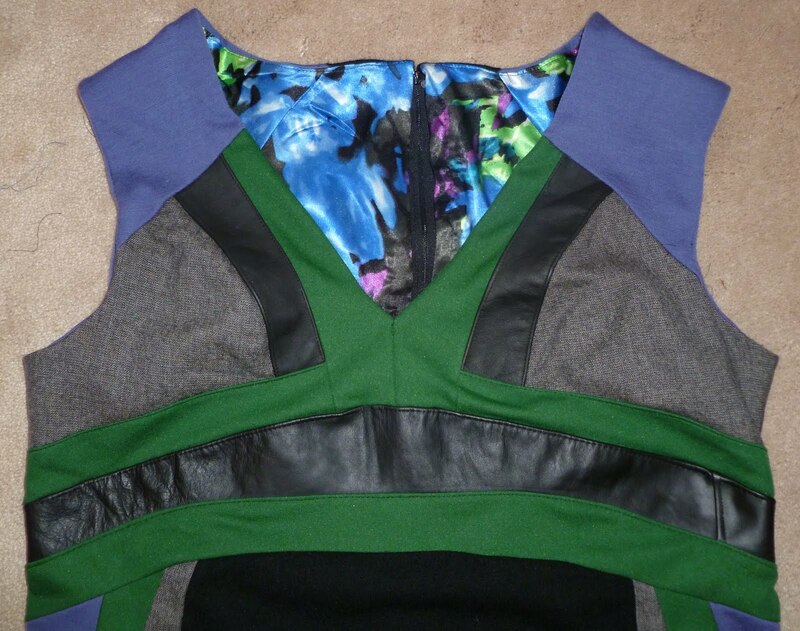 I took the time to hand prick the zipper to the lining as well as hand sew a blind hem. To see loads more detail of my process go to my blog Kathy Sews. For the pocket lining I used a scrap of black cotton that I had from a previous project. I took apart the uniform blouse completely and then used McCall's 5857 as a base, and then added the pockets to the back and made a higher waisted short. This was a really fun project! 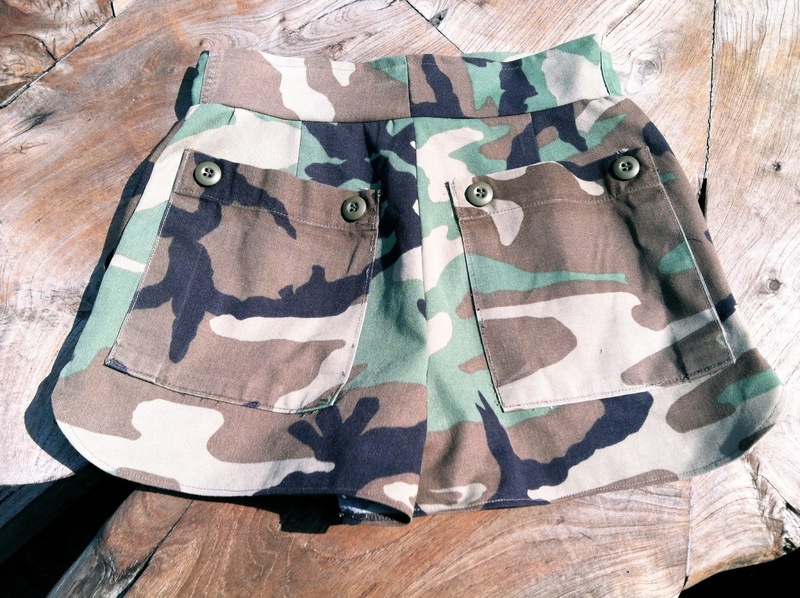 I have made a diaper bag and tote bag for friends out of old uniforms before, but never into another garment. I hope you like it! This challenge was so much fun and I was able to use all fabrics from my remnant pile, including several that I bought at Fabric Mart! 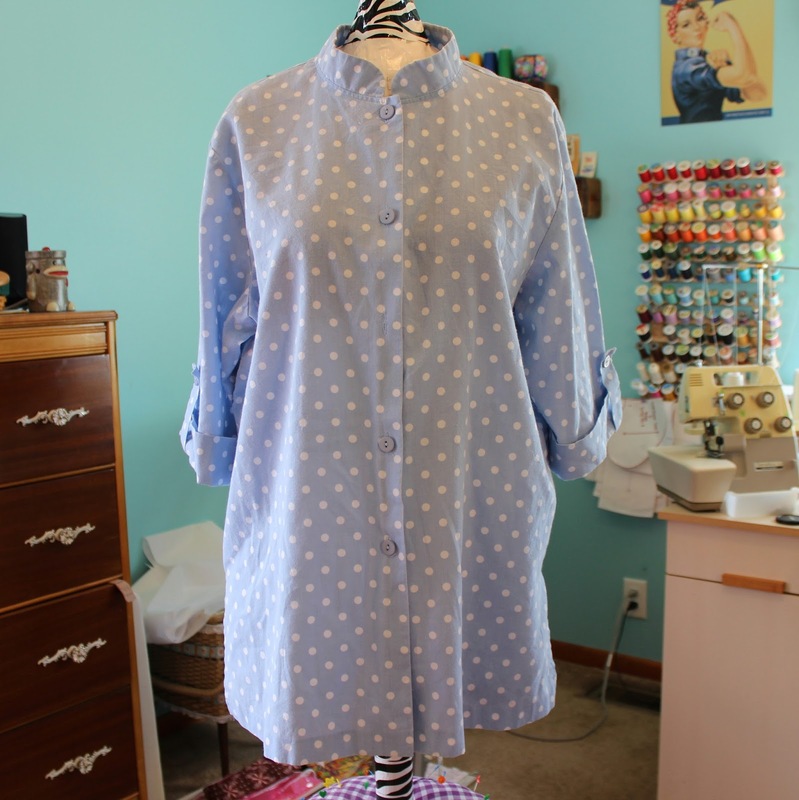 I used a version of Vogue pattern 1316 which had 39 pieces---had to alter it a lot to fit the fabric I had and my figure, but also learned a lot from this project. I also made some distinctive jewelry from curtain rod accessories to wear with the outfit. Read More about this project on my blog, deconstruct, alter, create. 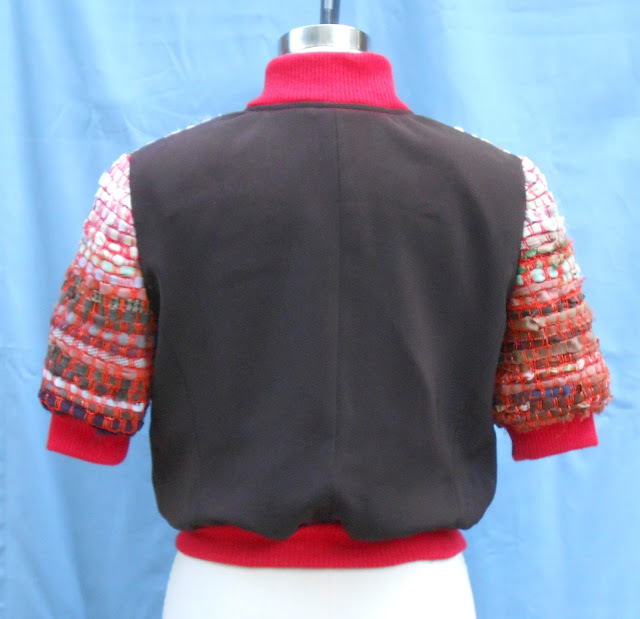 I made a short sleeved, bomber jacket with zipper front and ribbed bands at waist, sleeves and neck edges. 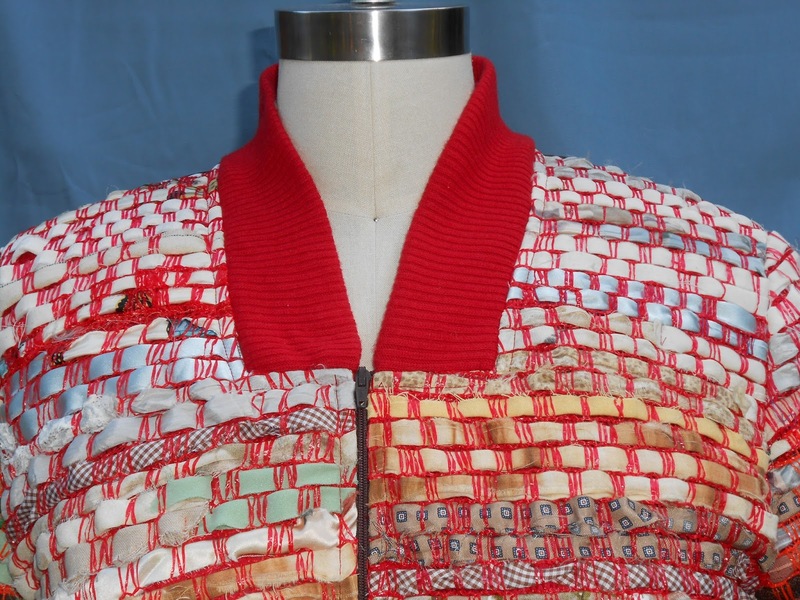 Front and sleeves are made from fabric created by weaving sewing room fabric scraps through polypropylene mesh fruit bags. 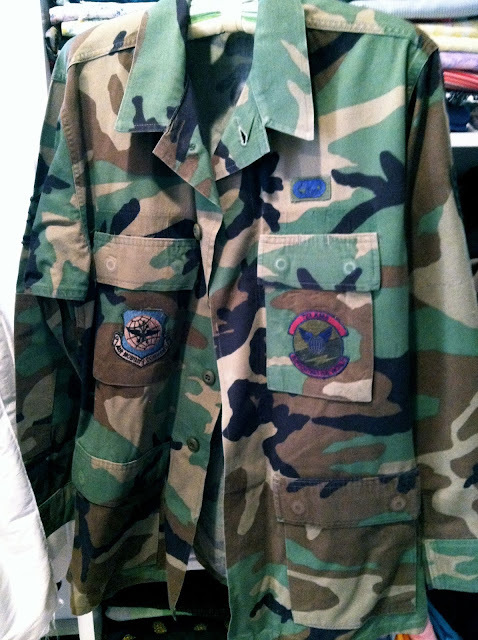 The contrast back and separating zipper were harvested from an old suit jacket. 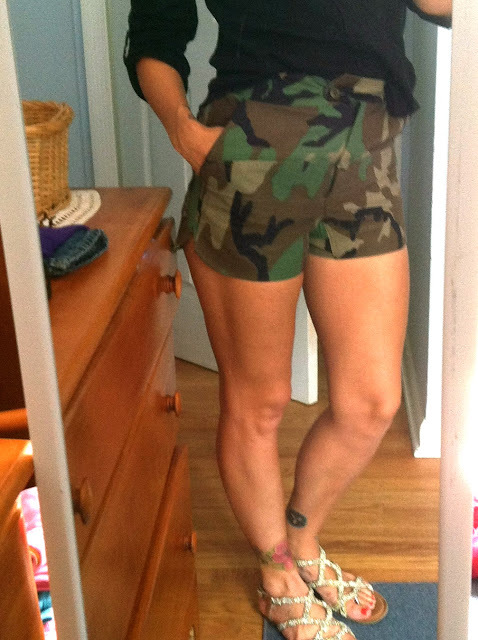 My top is a recycle from my Thrift store pile. 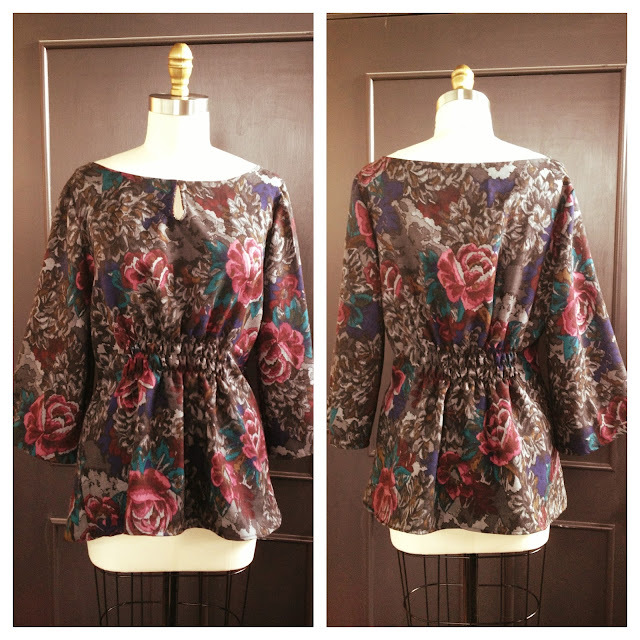 I made it more fashionable by cutting a high-low hem and cutting out the shoulders. 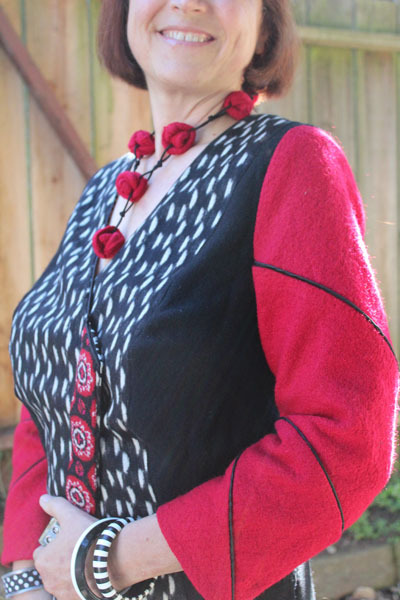 I trimmed the shoulder cut outs with lace trim from my stash and replaced the boring buttons with some white rose buttons that would stand out. My jeans are also from my thrift pile and I gave them some personality by cutting out some hearts and patching them up with scraps and embroidery thread. 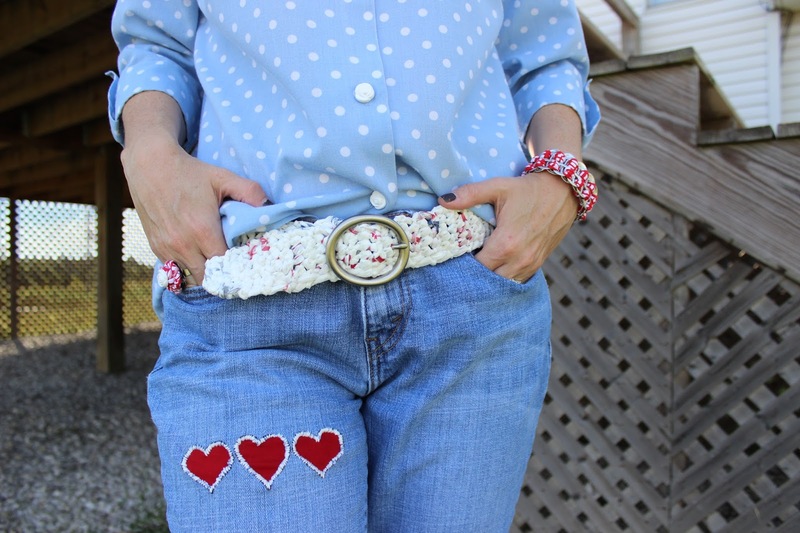 A belt made of plastic grocery bags crocheted together, a bracelet made of fabric scraps and pop tabs, a fabric scrap flower ring, fabric scrap necklace and earrings made from the shirt's original buttons. My shoes are also recycled from flip flops that almost made it to the trash can. 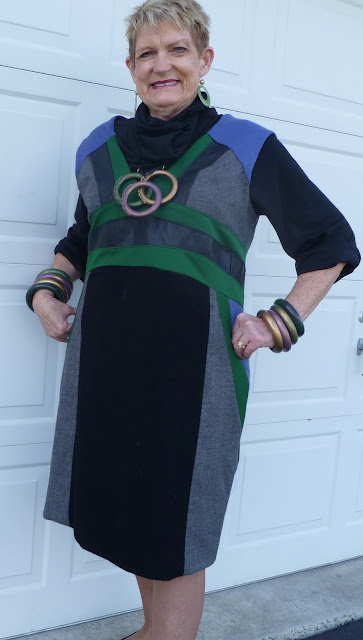 I refashioned the straps using and old cardigan that was on it's way to the Goodwill and some O-rings from my junk drawer. Read more about my project on my blog, Shanni Loves. I had a bounty of riches to choose from. I have many bags of fabric scraps, including some bags I haven't yet located. (I have more wool scraps somewhere!) I had a large bag of failed sewing projects, wadded up. After canvassing the contents of several garbage bags, I pulled out the bag that contained two failed projects. 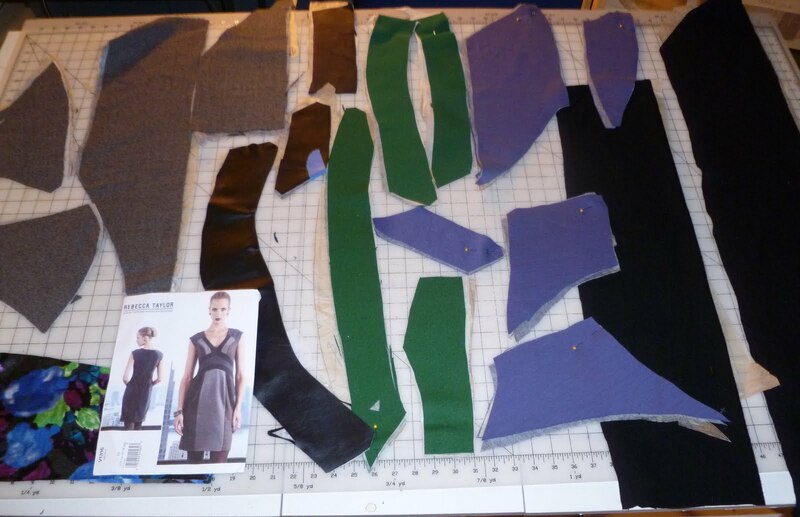 I decided to mix the fabrics together, along with some leftover fabrics from several other projects. I used 8 fabrics in all. Part of the challenge was to "utilize unconventional items to add accessories and embellishments". For this part of the challenge, I made a necklace. I got the idea for the construction of the necklace from a necklace I'd seen in a boutique. My twist on the original idea was to use the boiled wool, with the raw edges exposed. Read more about my project on my blog, Communing with Fabric. 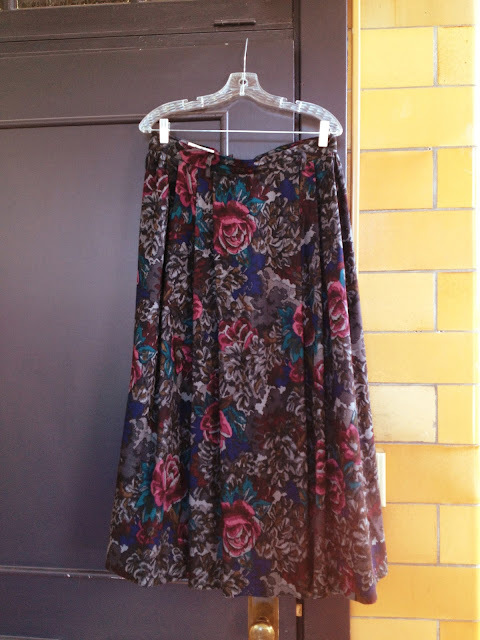 I rummaged through all of the "give away" clothes and found treasure! 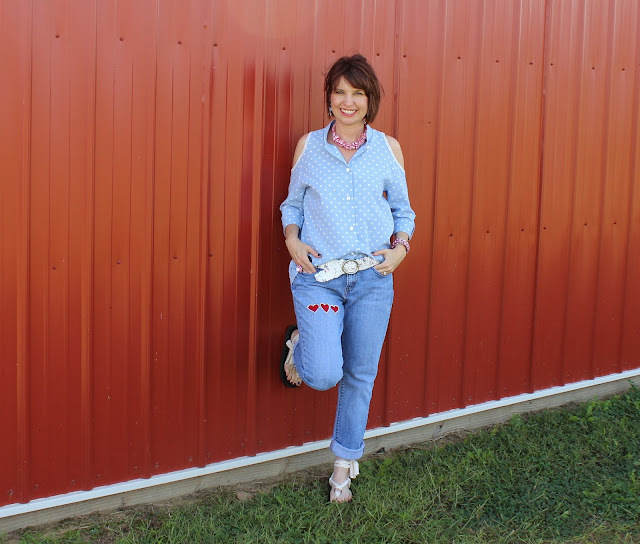 I love when menswear fabrics and details are used in women's fashion and with this challenge I had the pleasure of gathering from the boys and making it girly for a girl. I used old ugly aesthetically challenged culottes (yep, wool culottes), an old jumper I had from the early 90's and some worn out men's dress shirts (yes, I cut out the stains) and came out with a high-waisted 6 gore skirt with a men's dress shirt placket inset at the bottom. I used every last bit of the jumper and was able to refashion the "v" waistband from the culottes reusing the original stitching, lining and buttons. 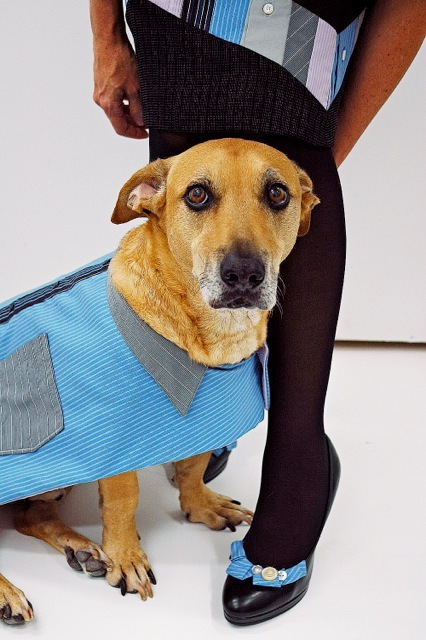 And of course an outfit isn't complete without accessories….upcycled pumps using a shirt sleeve and shirt buttons and a "dress shirt" for the sweetest accessory of all….my dog Jack. 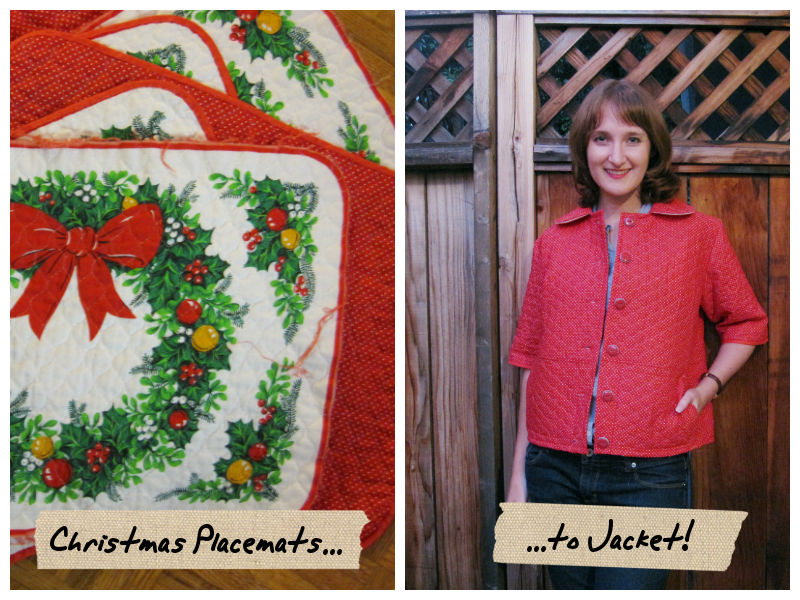 For this challenge, I used discarded Christmas placemats to make a lightweight quilted jacket. Each piece was cut from a different placemat using the polka dotted side, and the jacket was finished with a hong kong bound seam, a back ruffle with leather detail (also from a scrap), and includes two front pockets and a rounded collar. The binding, buttons, and thread all came from my stash as well. 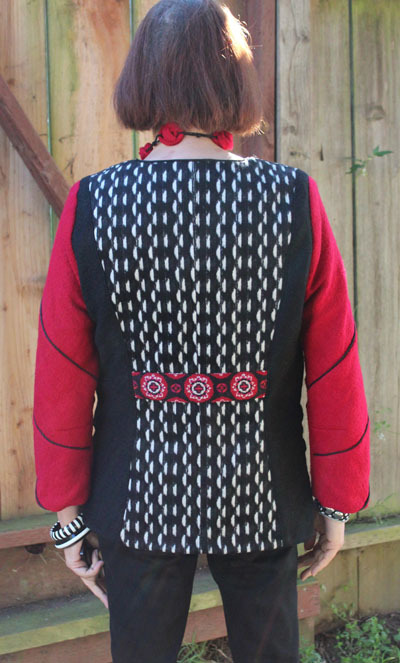 I was a bit skeptical that I could make anything wearable from scrap, but I have already worn this out once and love it! My recycled garment is made entirely of recycled and reused materials, except for the thread and the water soluble stabilizer I used to make part of the bodice with. 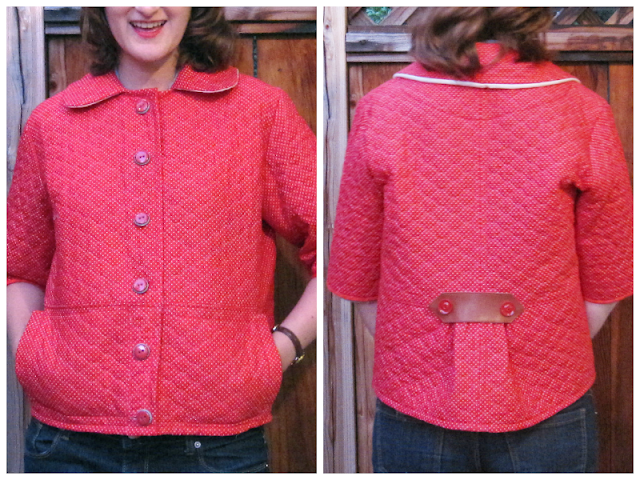 I used fabric scraps for the entirety of the garment. The top of the bodice is scrap lace and is a technique using fabric scraps between two pieces of water soluble stabilizer that is pinned together and then "quilted". The stabilizer is then put in water and dissolves. 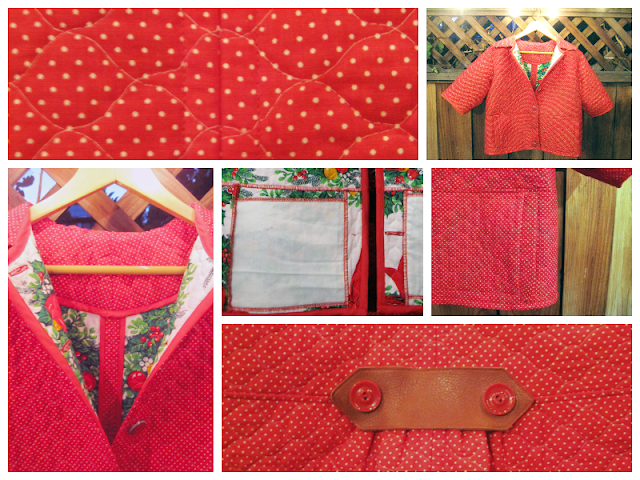 I sewed it to my main fabric which is also made of fabric scraps. It's a poly "dupioni" in emerald green. It is all underlined with purple china silk from Fabric Mart. The china silk is a bit of a "franken-fabric" as it's all fabric scraps sewn together like a scrap quilt. The buttons are from my grandma's button box. 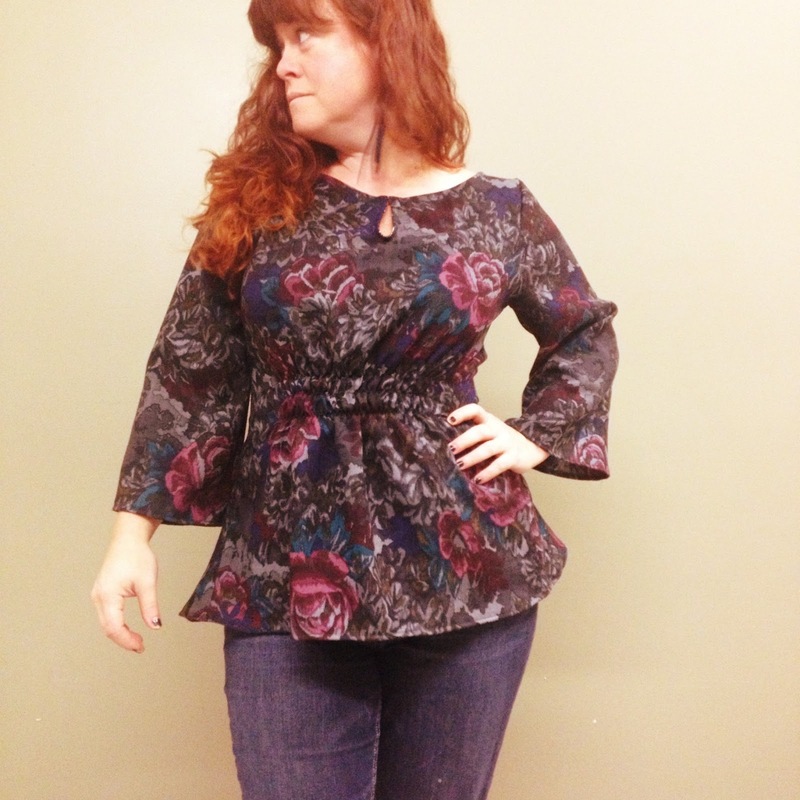 This pattern is a 1940s peplum blouse (Simplicity 1590). 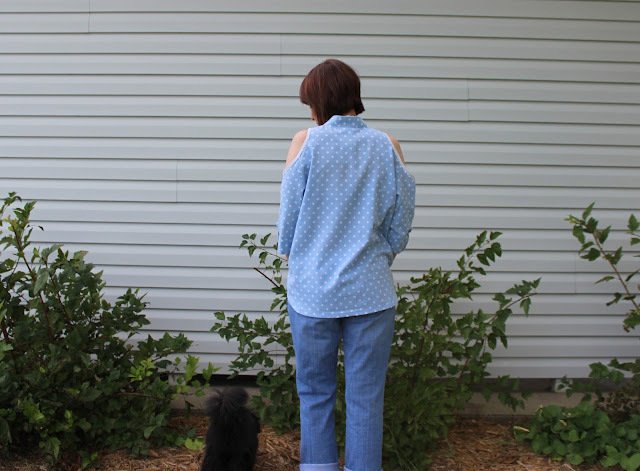 I also made the denim skirt to go with this blouse, but it is not made out of fabric scraps (cotton denim I just bought from Fabric Mart). I took a wool pleated skirt from the 80's and turned it into a keyhole tunic with a flared hem. Now it is time to vote for your favorite! Hurry! Voting ends this Wednesday at Midnight and the winner will be announced on Thursday. Your shirt/jacket is so much my style that I might try to make a similar one. I love it. So much creativity it is hard to choose!! I am *extremely* impressed by the creative entries!! Some amazing projects, but my favorite is Sharon's. They have all done a remarkable job!! Wow! Incredibly creative sewing! Very talented seamstress. Thank you so sharing. That was a great first challenge, everyone did a wonderful job with being creative. My choice though had a lot to do with fit. Sharon looked sharp. 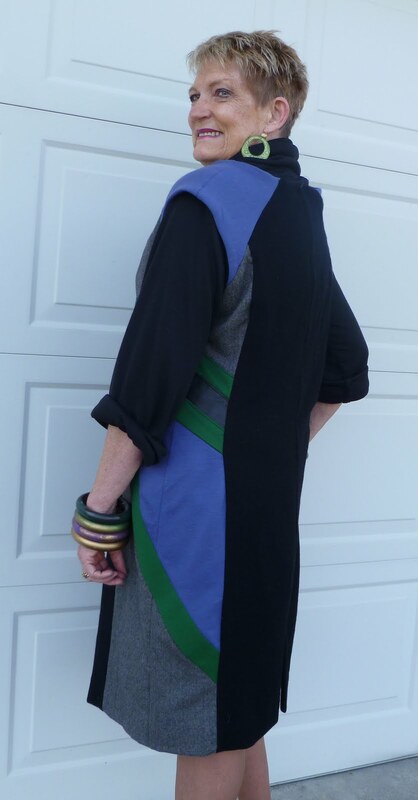 Sharon used real creativity to refashion a truly wonderful arty garment. In addition it fits extremely well. I had a hard time deciding between Audrey and Meghan! So many great choices - I wish we could pick our top three! Love the challenge entries but....why eliminate anyone? It would be so fun to see what each of these creatives come up with each week! I'd like to vote to change the rules! Wow, you ladies sure created some awesome entries! 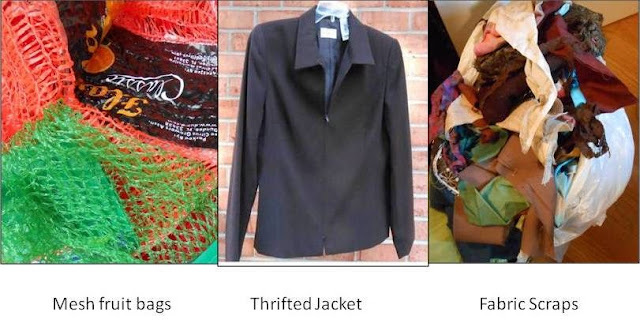 I love the variety in how you all chose to repurpose items--very inspiring! Oh what fun this is and so hard to pick my favorite,there are so many great and creative pieces .Can't wait for the next challenge. Ladies! Wonderful recreations! 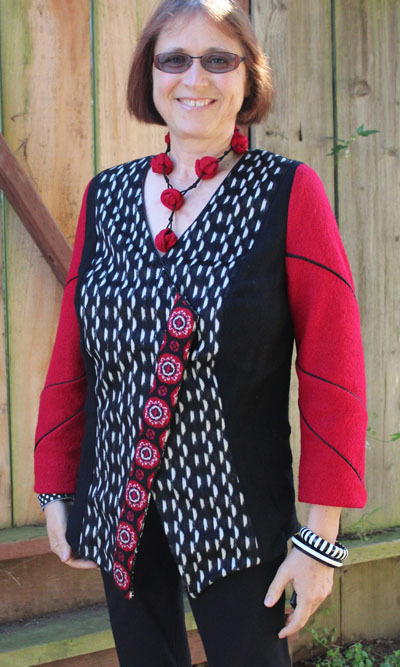 The creative ways that you made a new garment is simply amazing! All of you inspire me! Wow! I was very impressed with the creativity of everyone. Actually very inspiring! It was hard to make a decision on just one creation. Good job from everyone. Loved this project! Super idea! Sharon has done a wonderful job! I'm blown away by some of these ideas! Great job, everyone!